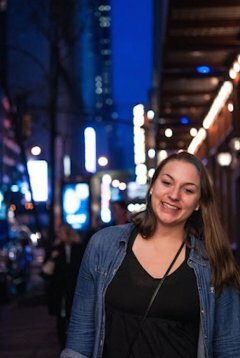 "After getting accepted into Duke I was bombarded with information and I quickly skipped over the Focus Program as another thing that I didn't need to do. However, during Blue Devil Days my mom sat in on the FOCUS information session and was completely sold. She immediately made me rethink the idea of being in FOCUS. I reluctantly took another look at the specific classes and the cluster and eventually was convinced myself. Thankfully I listened to my mom and applied for the program. Moms always know best! "Coming into college I knew I would gain a lot of facts, equations and formulas but I never thought I'd learn a new way of thinking. My FOCUS classes opened my eyes to a whole new perspective on the world and how we use our knowledge and education to give back to society. Being a part of FOCUS means that you will take classes with amazing professors and because of the small size, you will be able to build genuine connections with them. The professors in my cluster were eager to develop relationships with their students and I was truly inspired by their work and their passion. These professors have played an important role in my growth as a student and a person and I consider them my mentors and greatest teachers! "The program had such a huge impact on me that I came back each year to be a Peer Mentor in the Focus Program. I worked to facilitate greater connections between the students and professors in the cluster as well as provide more opportunities for learning. I was honored to help plan a ReFOCUS trip, both this year and last, that took K.I.S.S. students on a civil rights experience through Alabama and Georgia. The ReFOCUS trips are an opportunity for students to reconnect with their cluster and professors in the semesters following their FOCUS experience. "The Focus Program allowed me to immerse myself in an interdisciplinary learning community. I was surrounded by students who wanted to connect their interests and gain a better sense of their place in the world. I have enjoyed being a part of such an incredible program and can't imagine where I'd be without it. FOCUS was the best decision I have made in my Duke career and it transformed the course of my education and life."